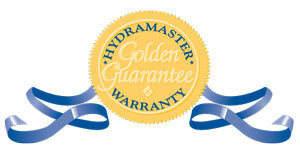 HydraMaster machine owners enjoy the most comprehensive warranty protection available in the truckmount industry. All components, large or small are included in the Warranty Plan, providing the owner with real warranty coverage against any part failure, large or small. Our machines are designed with a richness of detail and with many labor-saving features. The elegant simplicity of our design will always outperform more complicated equipment in the long haul. While HydraMaster equipment is extremely reliable and we endeavor to use only top quality components, if a malfunction should occur you’ll see why they call HydraMaster “Customer Friendly”. We look forward to having you as a member of HydraMaster’s family of satisfied machine owners. Simply put; every part, assembly and component is covered against defect or failure.